On October 18th,2018 Scott McClelland, President HEB Food & Drugs delivered the “Shell IACCGH Distinguished Lecture” at the Double Tree Hilton – Greenway Plaza. Over 90 guests attended the lecture, including the leadership from several HEB stores, across our region. 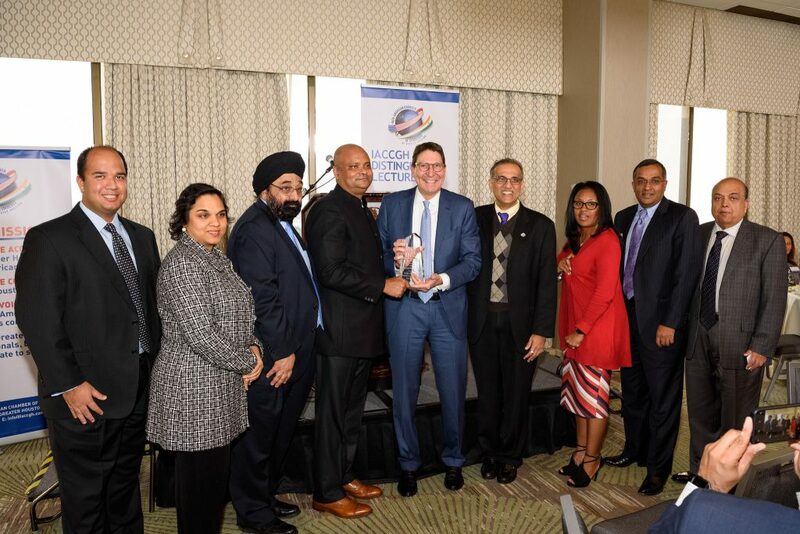 President Swapan Dhairyawan welcomed the gathering and mentioned that HEB had in the past received an IACCGH annual award for Corporate Citizenship, which was accepted on Scott’s behalf by his colleague Armando Parez and that they continue to be a “strong community citizen”. According to IACCGH Executive Director, Jagdip Ahluwalia, his presentation was one of the wittiest and insightful Distinguished Lecture hosted by the Chamber. Scott began his lecture by emphasizing HEB’s role in the Harvey recovery which showcased how the company behaves as a responsible citizen of the community it served. Sharing his journey, staring off as a management trainee driving delivery trucks for Fritolay to connect with his customers; he walked us through his rise to his current position as President of HEB. In his speech, he mentioned that HEB does over $25 Billion in total sales, with 400+ stores in Texas and Mexico, 13 manufacturing plants and five distribution center campuses. With over 106,000 partners, HEB is one of the largest private employers in the state with almost 95 % retention of department managers and store leaders. HEB also has new initiatives like curbside delivery, Meal-Simple, (healthy meals in minutes), unusual products like the crust-less “bare bread”, and Golden Temple atta “Rotis” in select stores. “Don’t be Complacent” he continued, stating that the company feels great partners and leadership in every store to be the most critical part of its business. Scott emphasized the need to focus on the millennials who are now the largest customer group in Texas. He also talked about the new reality & challenges of online shopping competing actively with instore business. While concluding, he also touched upon his upcoming role as Chairman of the Greater Houston Partnership and highlighted that he and the partnership share a common goals and priorities which include improving public education, better mobility, diversifying our business base to include more technology and biomed and to make Houston Business friendly by keeping our city healthy; both financially and culturally. Consul General Dr Anupam Ray who was the Chief Guest at the event, presented a token of appreciation on behalf of the chamber to Scott McClelland. Shell representative and IACCGH Board Member Alyssa Homes-Henderson, presented the vote of thanks.